Today's training will be over the Action feature. Actions are used to perform automated processes on activities. In most cases, once an activity has been completed, the system will proceed with the assigned actions. The only exception is when actions are used along with checklists. In that case, actions can be performed when all checklist items have been completed or when there are checklist items still left to do. You can have as many Actions on an activity as necessary but only 1 action is run at a time. For this training I will cover actions that DO NOT use checklists. Click on the "Create Actions..." button to add an action to the activity. Each action is given a title which is used in a selection menu. If more than one action is added to an activity, the title needs to be descriptive enough to make a correct choice when the menu is displayed. Any combination of the 3 options can be used in an activity. As long as you have at least one of the 3 action types selected the system will perform the action as required. Setting up standardized message templates are one of the time saving aspects of a workflow. Messages help answer common questions, report on the status of a project, and provide information to common issues. Having the ability to send standardized messages by email, Facebook, SMS Text LinkedIn or Twitter allows you to quickly engage with your customer without consuming large chunks of time writing them. Send Manually (With Preview) – will display a menu to allow you to see a preview of the message and make changes before it is sent. Send Manually (Without Preview) – will send the message when you specify to run the action but does not give the option to preview before it is sent. Send Automatically – this will send the message automatically based on the date/time of the activity if both are specified or if just the date is specified then it will be sent at the specified time in the SETTINGS > EMAILS option screen. Send Immediately – this will send the message when the activity is created and automatically mark the activity as complete. This is useful when you want an email to be sent as soon as the workflow is started. The third menu allows you to choose the correct message template to send. The list of message templates depends on the "Use With" selection of the workflow. The Action Tags are used to automatically assign or remove tags from a database record. As your workflow progresses through its normal steps, the ability to indicate the key milestone location helps get a perspective on the current state of your system. If you are using a lead generation workflow, the “New Lead” tag can be assigned to a contact that just got put into the system. 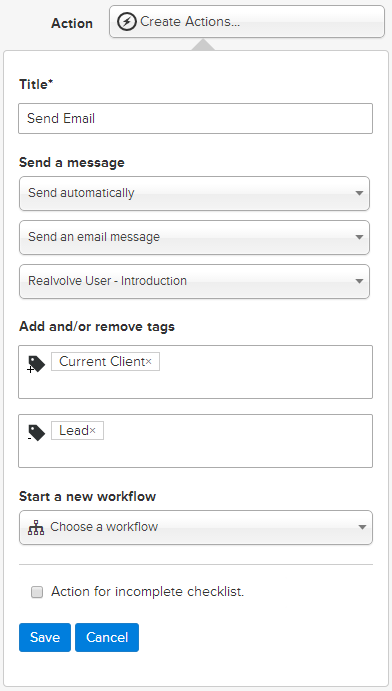 Once the lead becomes a customer the workflow can automatically change the tags from “New Lead” to “New Customer” so you don’t have to think about it. To Add tags, type the tag name(s) in the ADD TAGS field or remove tags under the REMOVE TAGS field. If the Workflow “Use With” is Contact then tag changes are applied to the contact(s) assigned in the “With” field. If the Workflow “Use With” is Property and there are no contacts in the “With” field then tag changes are applied to the Property assigned in the “About” field. If the Workflow “Use With” is Transaction and there are no contacts in the “With” field then tag changes are applied to the Transaction assigned in the “About” field. If the Workflow “Use With” is either Property or Transaction and the “With” field does have at least one contact assigned then tag changes are applied to the Property or Transaction by default UNLESS the “Add/Remove Tags from Contacts” is selected. This option forces tag changes to be applied to the contact(s) assigned in the “With” field. The ability to start a new workflow from an existing workflow is an important part of organizing yourself to be more efficient. You may want to start another workflow once the current workflow is completed. Another possibility is that your workflow process can not proceed in a single linear path and may need to branch a different direction based on the outcome of a given question or workflow step. In either case, by selecting the next workflow process, you can start that process automatically based on the needs of the current activity. Starting the workflow in this method take you through the same workflow wizard that was used when starting the original workflow however, some of the required fields will be automatically filled in using the originating workflow.